I used to not enjoy making Halloween costumes. Like…at all. 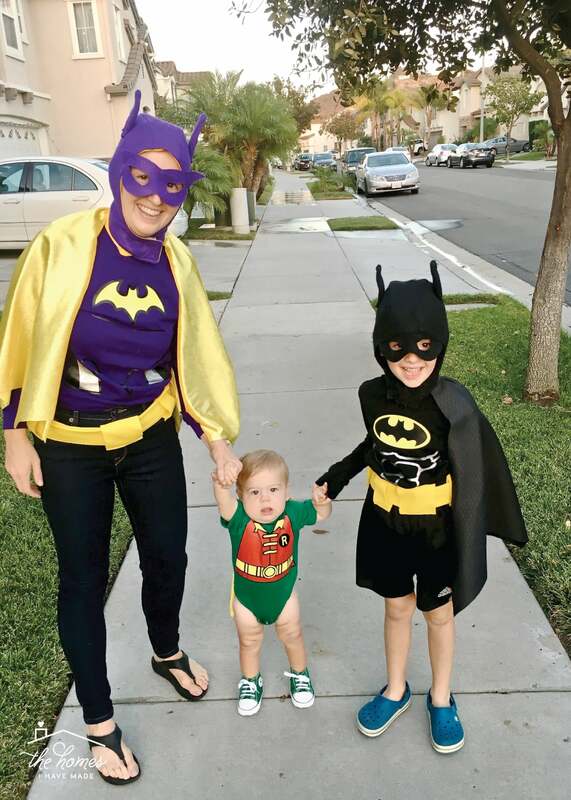 But over the years, I’ve slowly come to love our family’s tradition of picking out costume ideas/themes and bringing them to life with my own two hands…all while the boys excitedly look on (just like I did when my Mom made my costumes as a kid!) 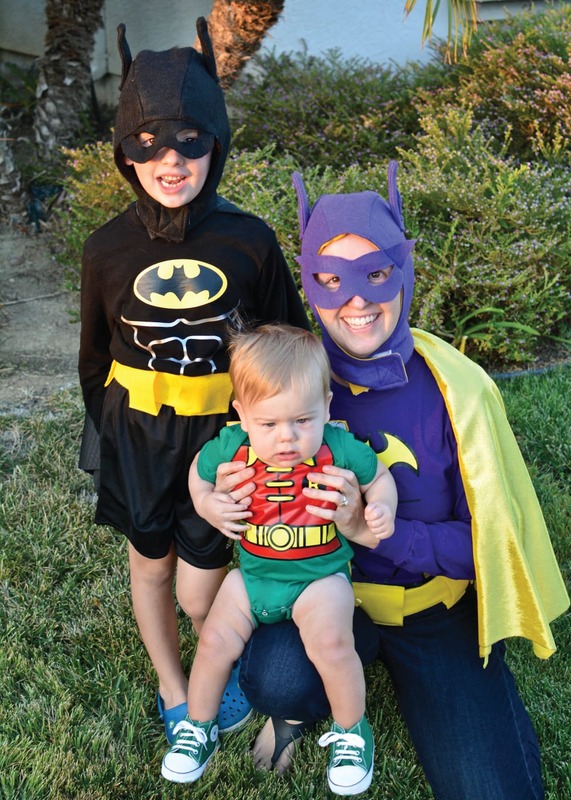 Last year for Halloween, the little boys and I dressed up as LEGO Batman, Batgirl, and Robin; Greg didn’t get a costume because he was deployed at the time (Henry said if he was home, he could have been LEGO Alfred, ha!). These costumes were so much fun to make, as I had to get really creative in order to replicate these beloved LEGO mini figures. The costumes turned out adorable (if I do say so myself! ), and they were also relatively quick and inexpensive (as Halloween costumes go). 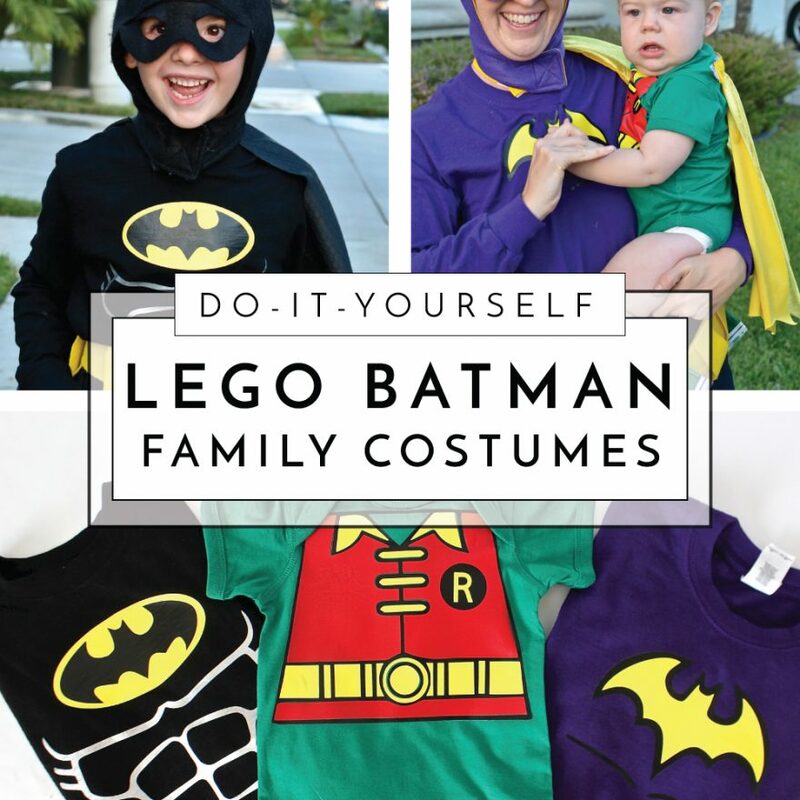 If you have a LEGO Batman lover in your home, this step-by-step tutorial will help you pull together a LEGO Batman Costume, as well as costumes for his sidekicks, Batgirl and Robin, too! 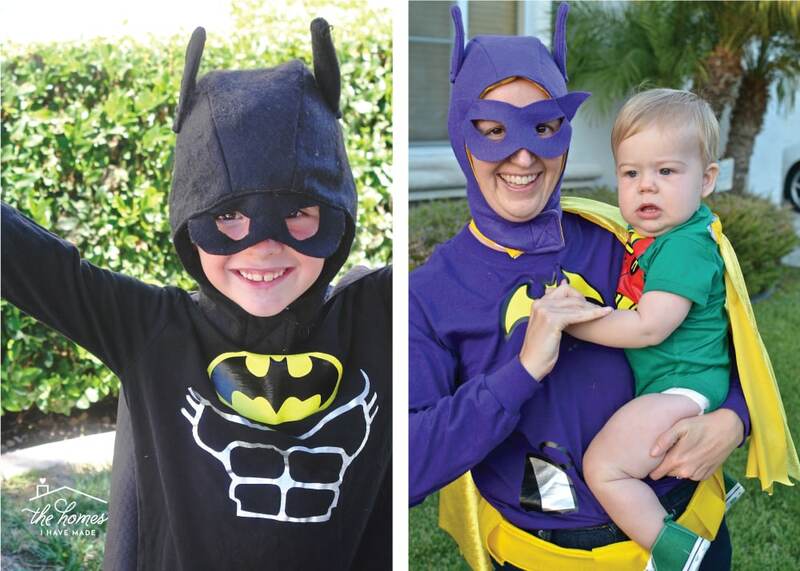 These costumes consist of four different elements: shirts, hoods, capes, and belts. While they are certainly simple and clever, this costume concept is also great for parties or school parades because the kids aren’t wearing big, cumbersome costumes. After Henry’s school parade, he was able to ditch his hood, belt and cape and play the rest of the day in his shirts and shorts. 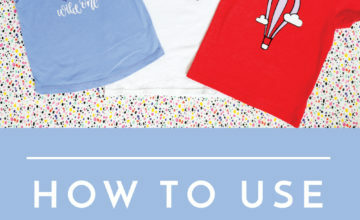 Aside from the iron-on vinyl (which can get pricey), everything else is made with inexpensive felt, novelty fabrics, and off-the-shelf shirts. 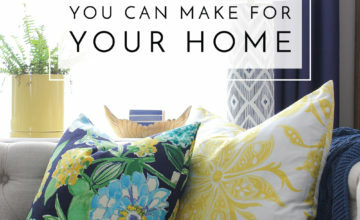 You can find all the supplies at your local fabric store, and pull everything together in just a few days! 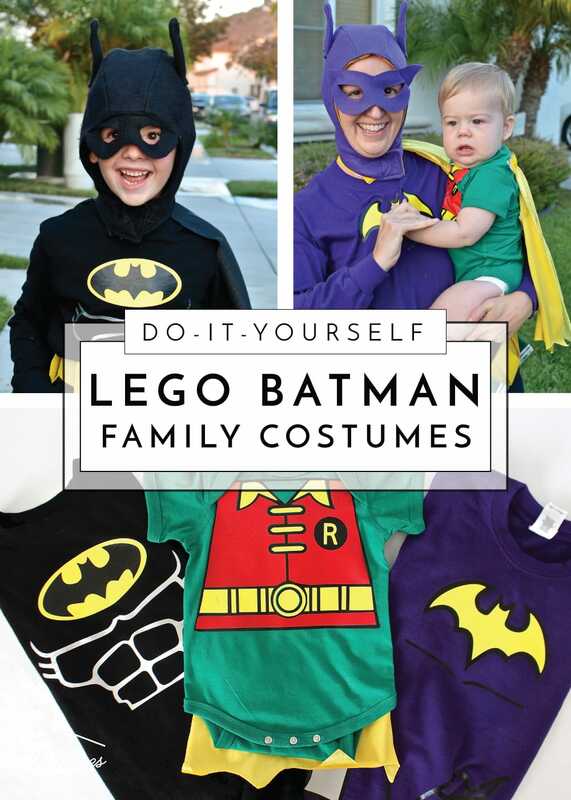 The center of these costumes are the shirts designed and created to look exactly like the LEGO Batman, Batgirl, and Robin mini figures. These designs were cut from iron-on vinyl with my Cricut Explore and then secured to the front of the shirts using an iron. However, before you can cut and apply the designs, you have to create the designs first! 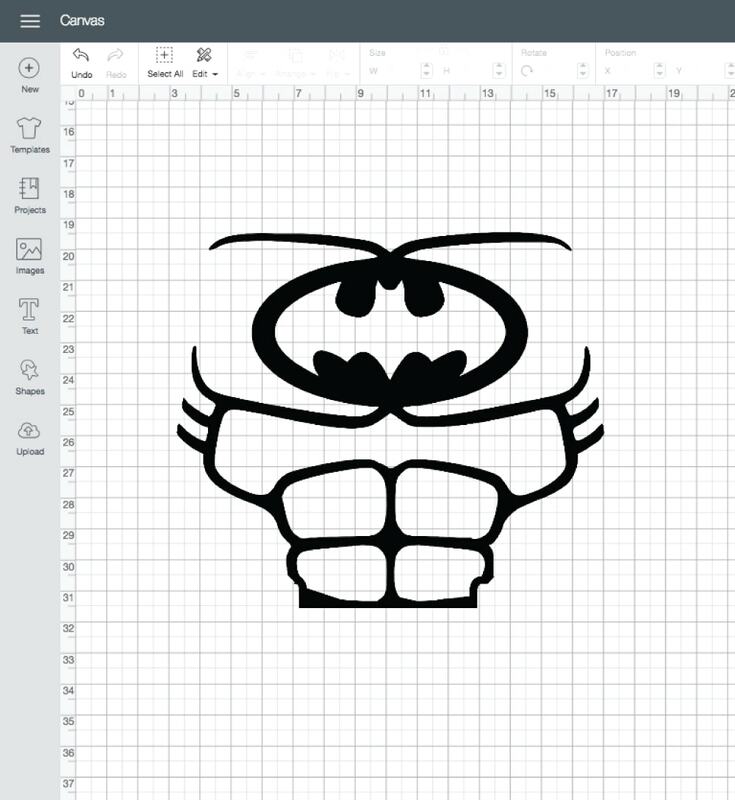 I was actually able to find SVG files (cut files) for the Lego Batman abs and logo here. However, I wasn’t able to find the Batgirl and Robin designs ready to go, so I decided to make my own using coloring pages!!! Admittedly, this is the most tedious part of the whole project; but it’s not hard, and I’ll walk you through it! 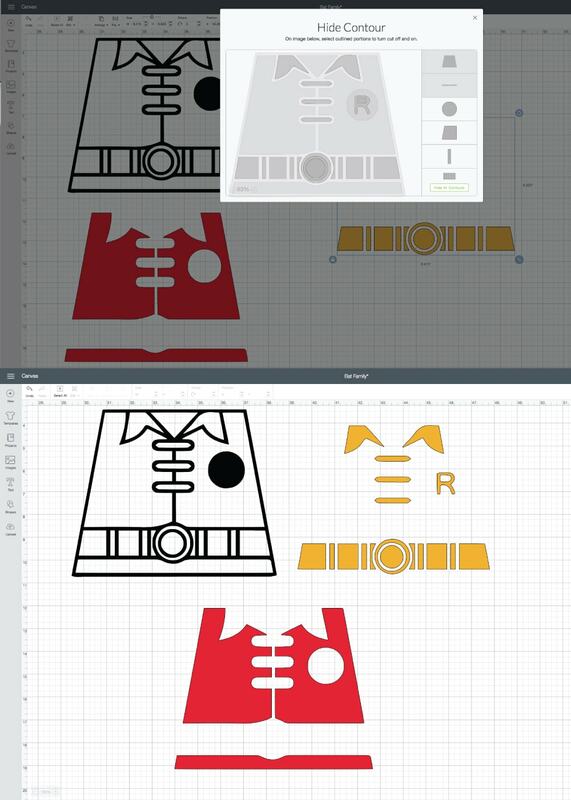 I work in Adobe Illustrator a lot, so I was able to import the coloring pages, trace the images, and then crop the parts of the design I needed (using the Pen Tool) before exporting them as SVG files to use in Cricut Design Space. If you are proficient in Illustrator, I recommend you prepare the designs in this way (use the image below as your reference). However, I realize most people do not have access to Adobe Illustrator nor do they know how I use it, so I will show a different method anyone can use to make these cut files! 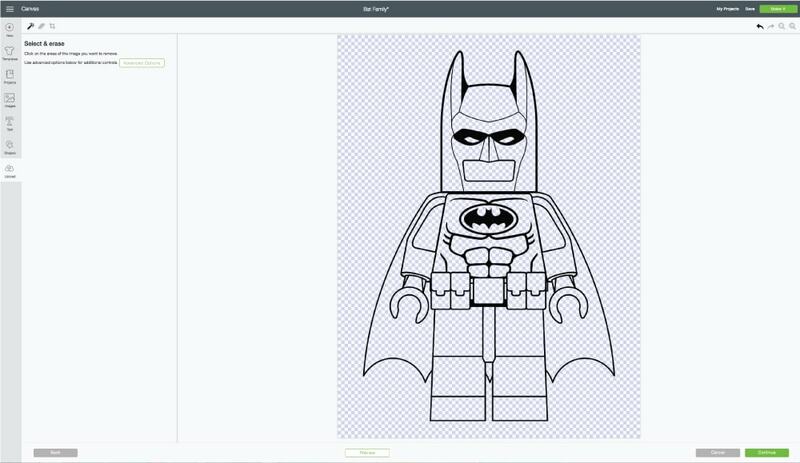 Start by searching “Lego Batman Coloring Pages” in Google to find the version you like. This one is a good one to start with. Whatever image you use, it needs to be either a PNG or JPEG. If the coloring page isn’t available in that format, use the Screenshot tool to capture it. Next, upload the coloring page into Cricut Design Space and clean up the image until only the black outline remains. 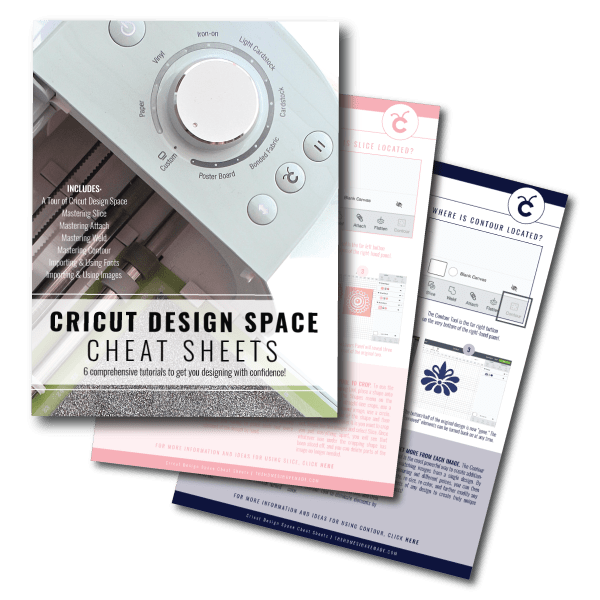 If you need help uploading your own images into Cricut Design Space, use my tutorial here. 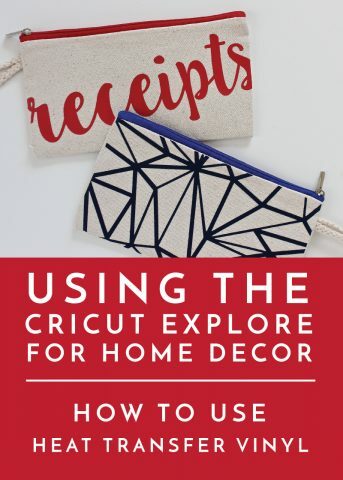 Once you have it imported, place it on a New canvas within Cricut Design Space. To get rid of the parts of the design you don’t want, you’re going to use a combination of the Contour Tool and the Slice Tool. Start with the Contour Tool to turn off as much as the image as you can, while keeping the parts of the design you want turned on. If you need help working with the Contour Tool, use my tutorial here. Once you have the basic outline of the stomach design for each character, you can then duplicate the design(s) and use the Contour Tool again to highlight the different parts of the image you want to cut into different colors. By turning various parts of the design on and off, you can color any single element any way you want! 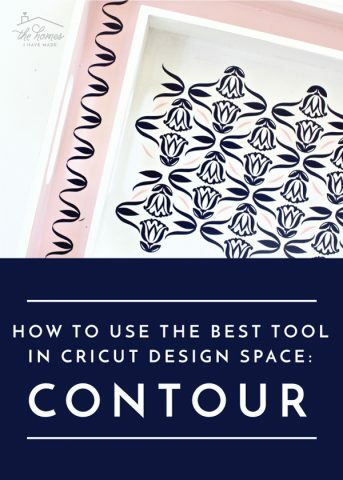 (Again, use this tutorial to help you with the Contour Tool). TIP! 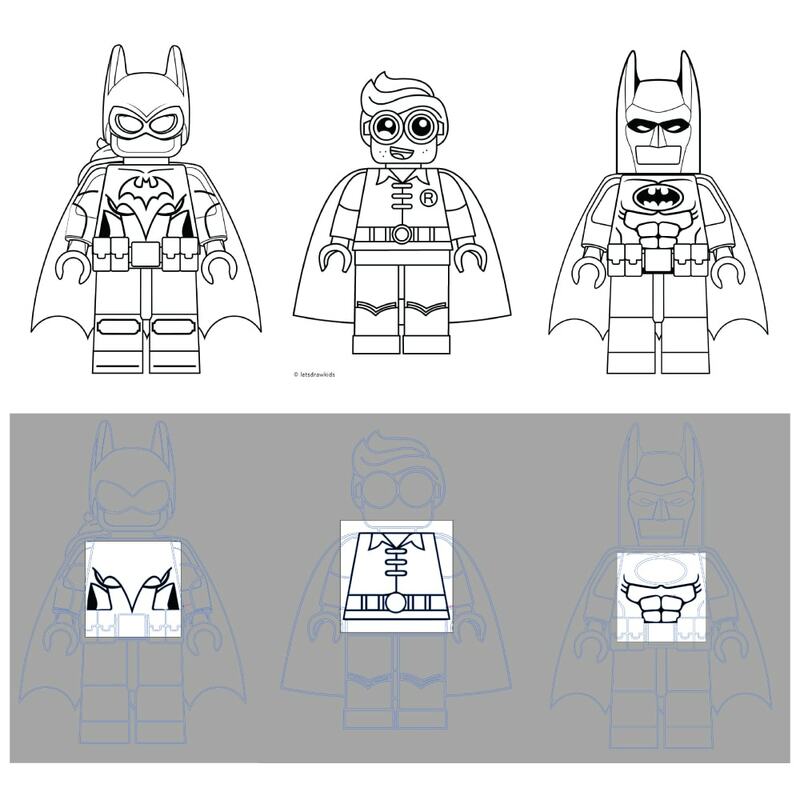 Don’t hesitate to refer to images of the LEGO figures for reference on coloring, spacing, sizing etc. After Contouring, Slicing and re-coloring the designs as needed, you should have the various shirt images for each character all ready to go! Use them in the tutorials below. 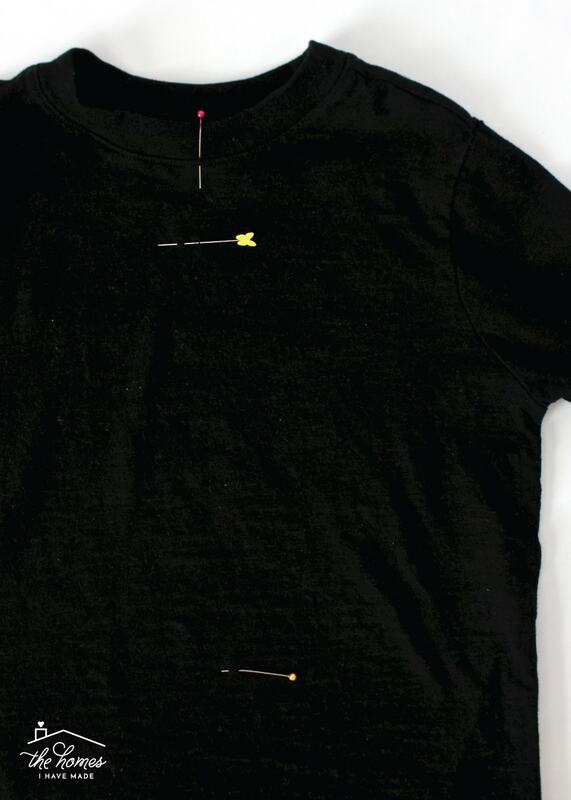 To identify the correct placement for the shirt design, I recommend putting on the shirt to find the center, as well as the top and bottom locations for the images. 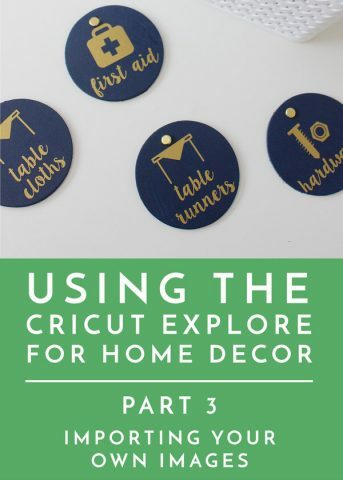 Use pins to mark those placements, and then adjust the design sizes in Cricut Design Space before cutting them out. 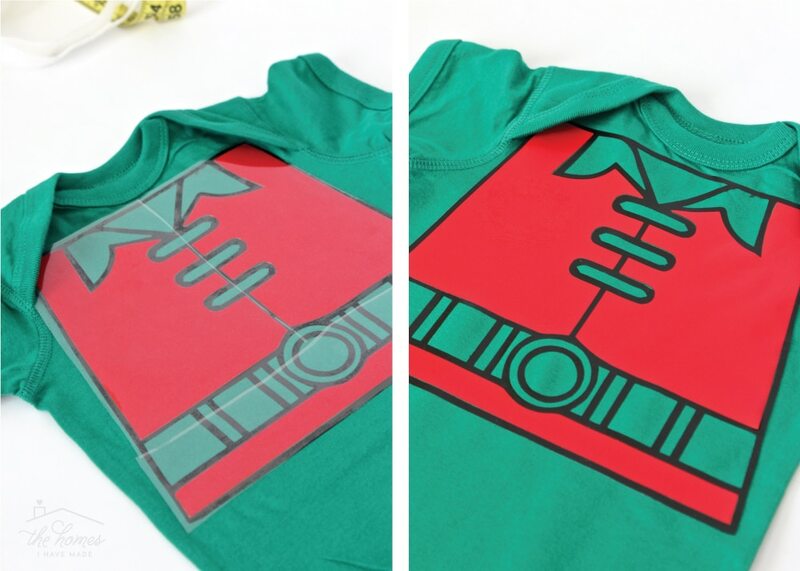 Once sized appropriately in Cricut Design Space, cut each shirt element from the right color iron-on vinyl and weed them appropriately. 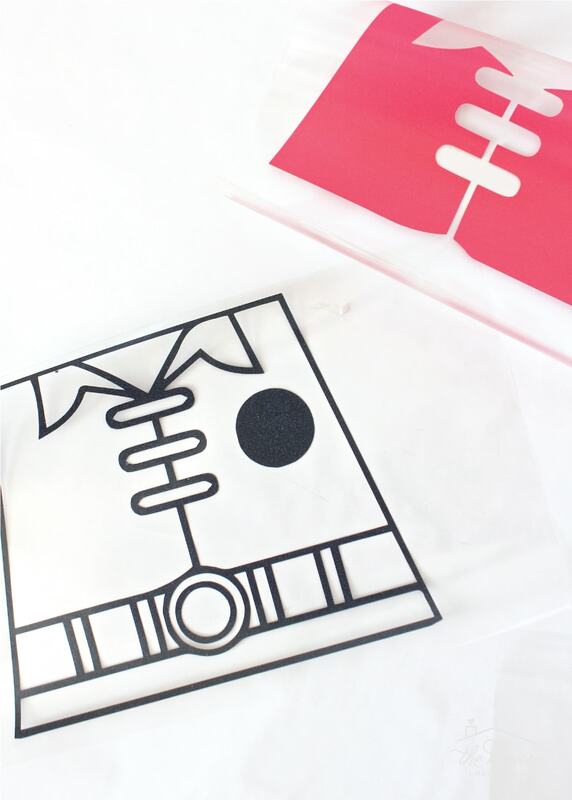 If you’ve never worked with iron-on vinyl, see my detailed tutorial here for more tips. 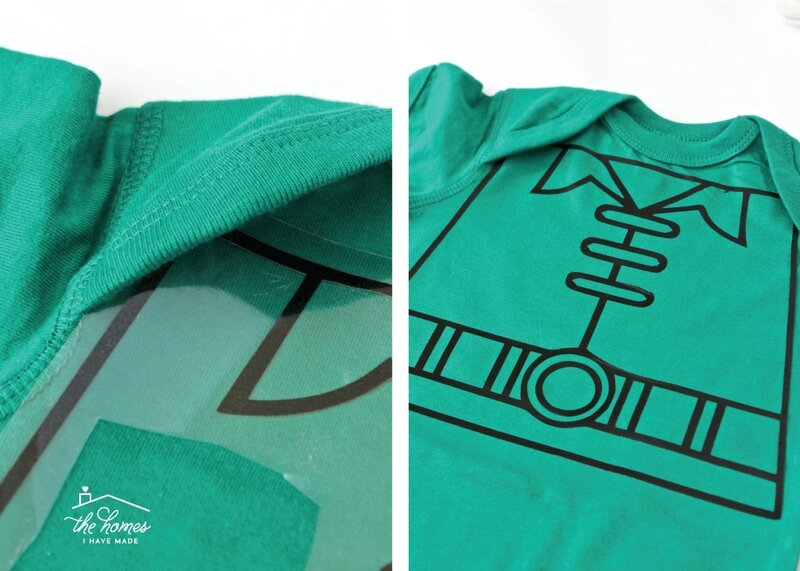 With an iron or heat press machine, apply the iron-on vinyl designs to the shirts within your pinned boundaries. 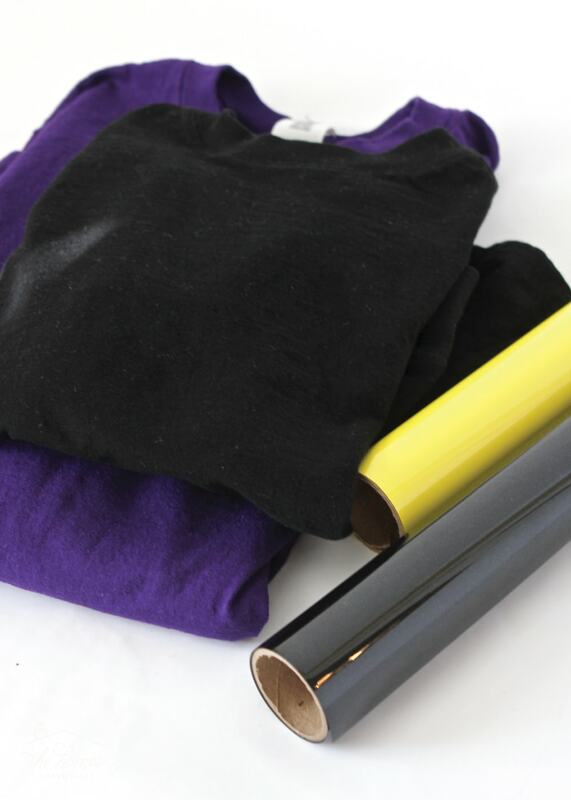 If you are layering different colors of iron-on vinyl, be sure to time the heat appropriately so as not to melt the first layers of vinyl. 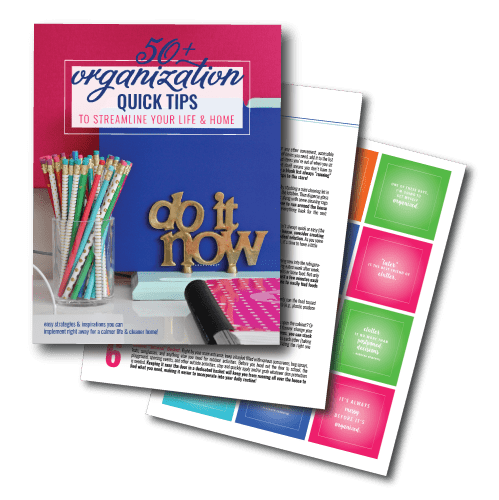 See my post here for tips. 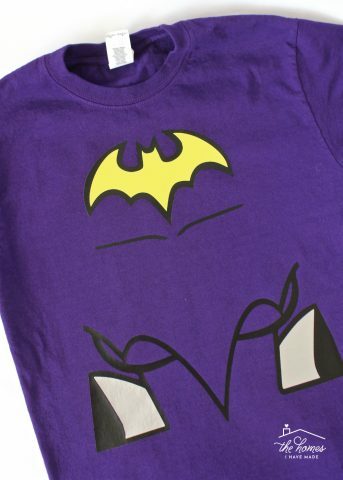 And with the magic of heat and a little iron-on vinyl, LEGO Batman’s and Batgirl’s shirts are ready to roll! With the shirts done, it’s time to make the head piece with the bat ears. 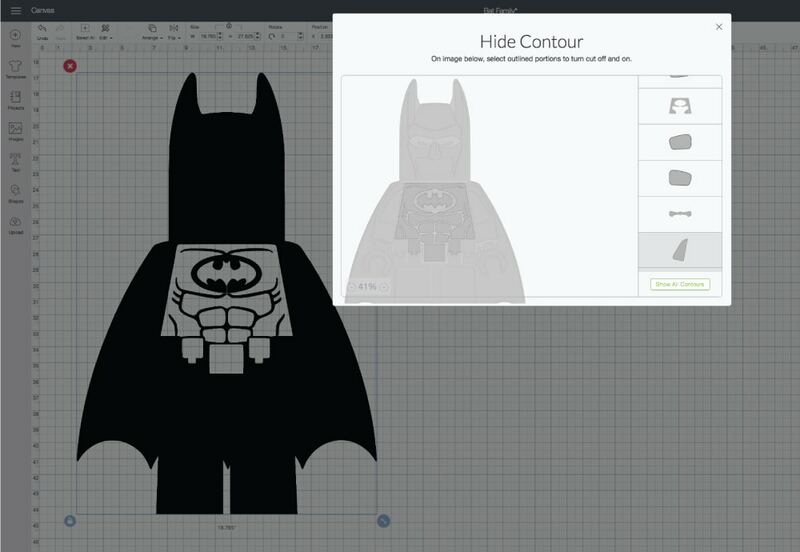 I searched and searched and searched for a simple, free tutorial that I could use to make Batman and Batgirl hoods. After coming up empty handed, I finally turned to the costume books at the fabric store and settled on McCalls Pattern M5952. I hate sewing from patterns, but I knew sewing a rounded shape that would actually fit on our heads would be too tricky without one. I’m happy to report this pattern was simple, and the results were great! I recommend making the hood(s) with colored felt and a cotton lining, and you will likely need to improvise the eye masks to look more like the LEGO characters. 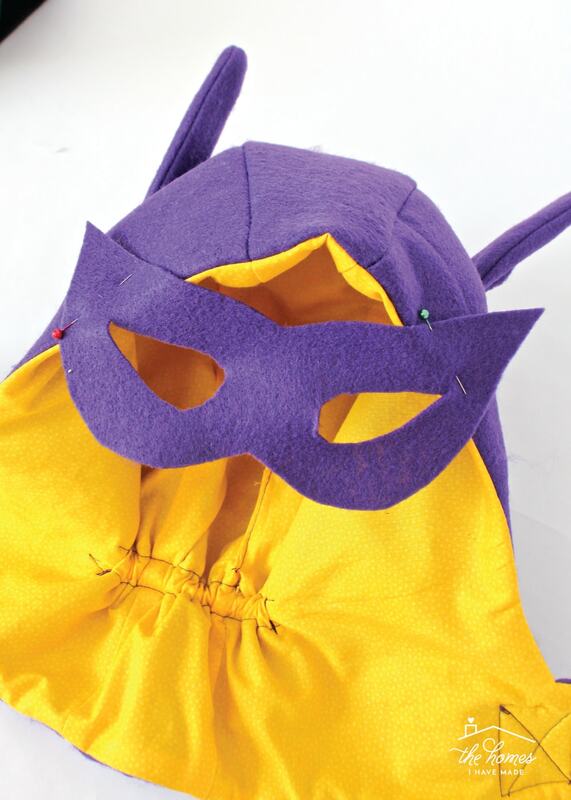 For Batgirl, draw your own design onto more purple felt and then top-stitch it in place over the finished hood seams. 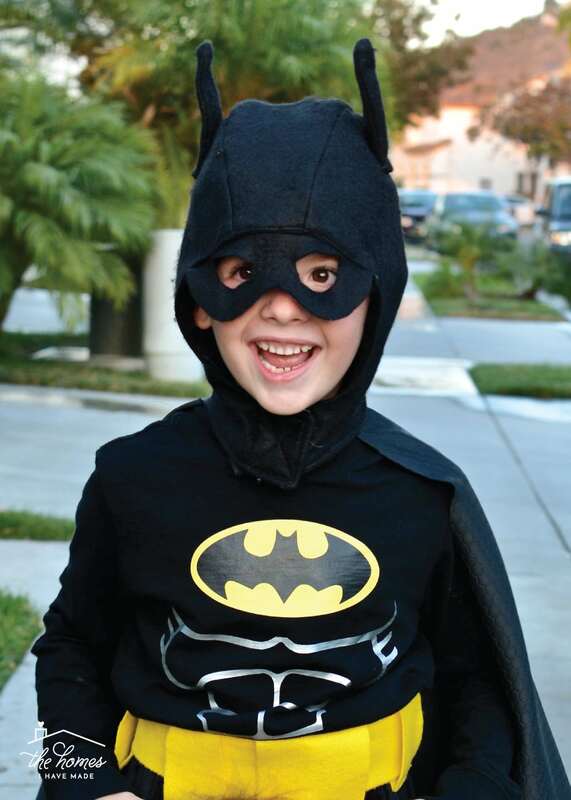 For Batman’s hood, cut a mask shape that will fit your child’s face, leaving extra room at the top of the eye holes. Place the entire top of the mask on the inside of the finished hood and then top-stitch in place around the face of the mask. TIP! Have your Batman try on the hood and pin the mask in place before sewing to ensure the eye holes will hit at the right spot! I don’t have detailed pictures of how I made the belts, but if you look closely at them, you can probably figure it out. I simply cut 3″ wide strips of yellow felt to fit around each of us. I then created several “belt loops” with more yellow felt and strung them onto the belts. We spaced out the belt loops to look like Batman’s ammunition pouches. The final element to the LEGO Batman and Batgirl costumes are the capes. 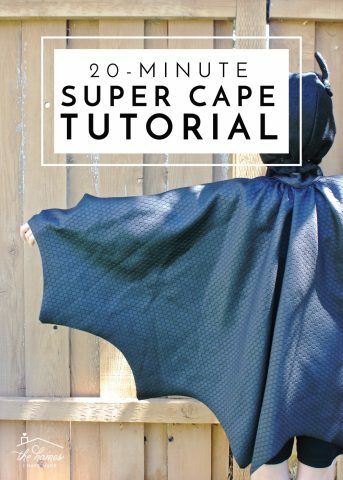 You can either buy black and yellow capes or use my 20-Minute Cape Tutorial to make your own! 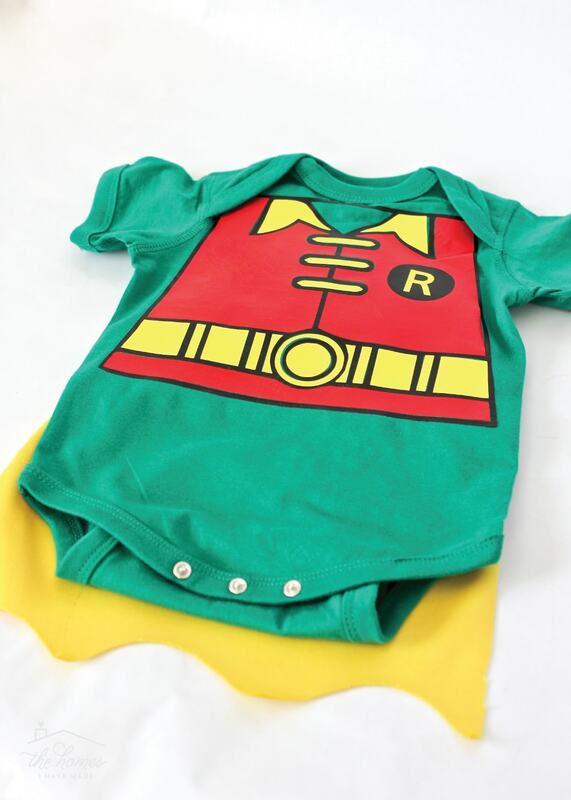 The Baby LEGO Robin Costume comes together in a very similar way as the adult/kid LEGO Batman and Batgirl costumes, but with a few nuances (more colors, no hood, etc). Let’s go through it. 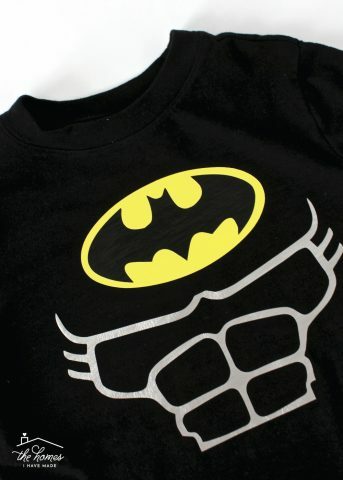 Just like the LEGO Batman and Batgirl costumes, size the shirt design to fit the child/baby. 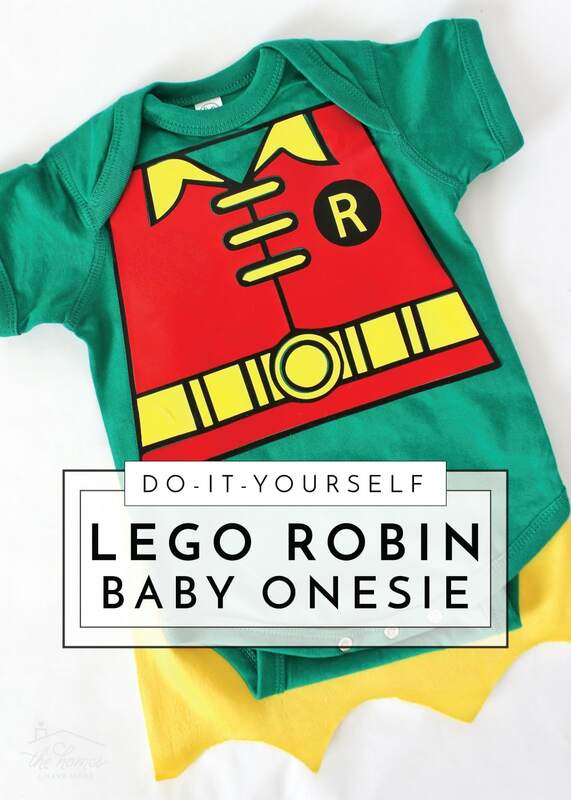 Since LEGO Robin doesn’t wear pants, don’t hesitate to use up mot of the onesie with the design. Once you’re satisfied with the sizing, cut out the designs from the three colors of iron-on vinyl and weed accordingly. TIP! When cutting letters and/or asymmetrical designs from iron-on vinyl, you need to make sure you you reverse the image before cutting. 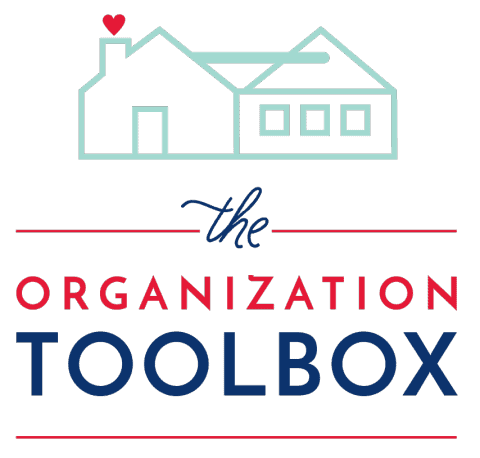 See my post here for more help. LEGO Robin’s design is a bit different in that there is a black outline, as well as red and yellow fill colors. This will require a good bit of ironing and puzzling the design together. I recommend starting with the black outline, applying only as much heat as needed to get the vinyl to pull off the plastic cover layer. Next, place all the red elements into the black outlines and iron them in place, again using as little heat as possible. Finish up by ironing on the yellow and “R” patch. 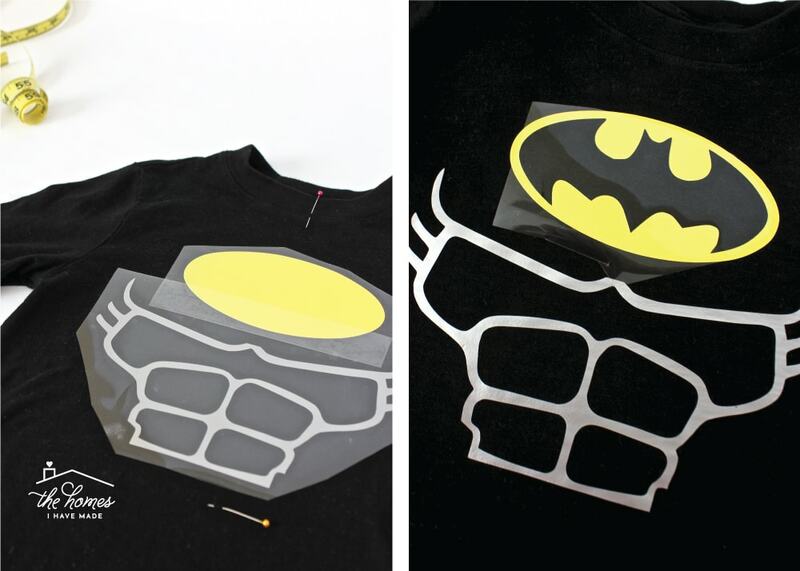 By the time you apply the yellow vinyl, you’ll have applied quite a bit of heat to the black and red vinyls already on the shirt…so again, use as little heat as possible to avoid melting the rest of the design while ensuring the yellow is fully adhered. LEGO Robin doesn’t wear a hood but he does wear a mask. 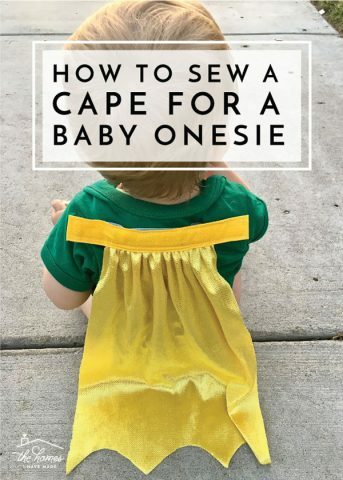 If you think you’ll child will wear it, I recommend using this tutorial or buying this one. I knew Sam wouldn’t keep it on so I didn’t even bother. 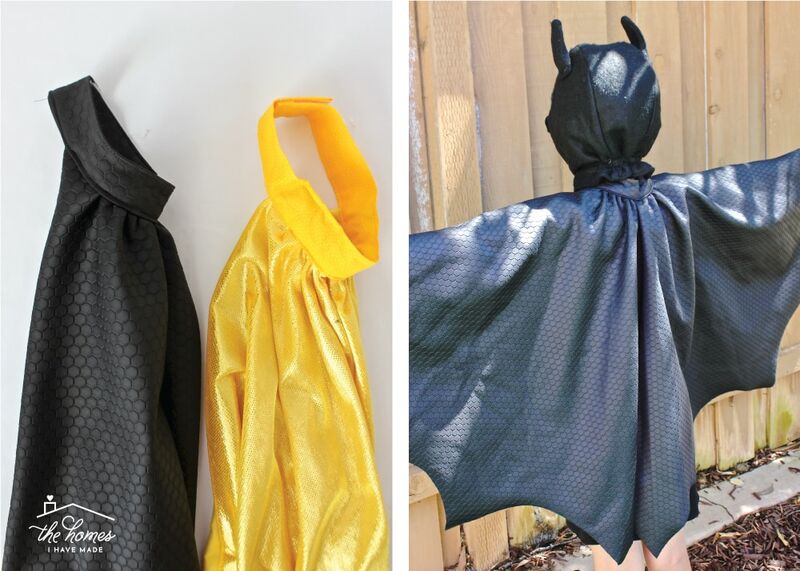 If you are making a LEGO Robin costume for an adult or child, I recommend you use this cape tutorial. 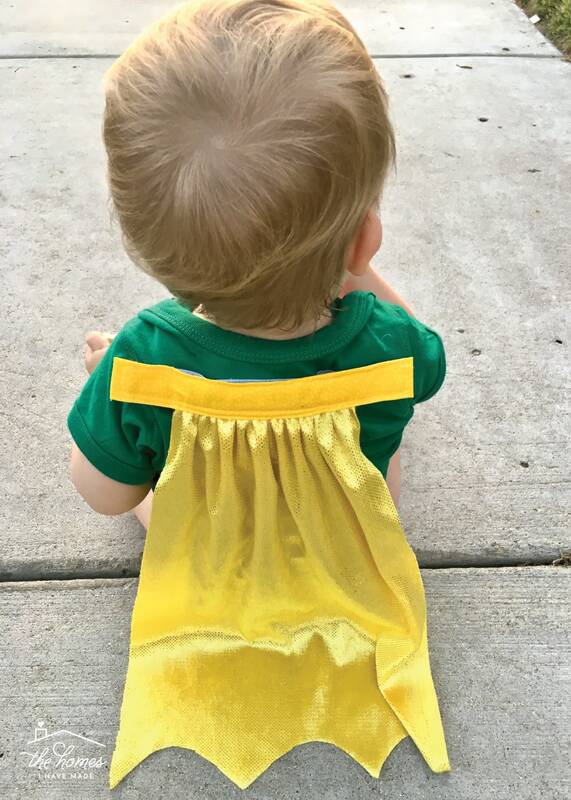 If you are making a Baby LEGO Robin (or any baby super hero), be sure to check out my super simple Baby Cape Tutorial here! 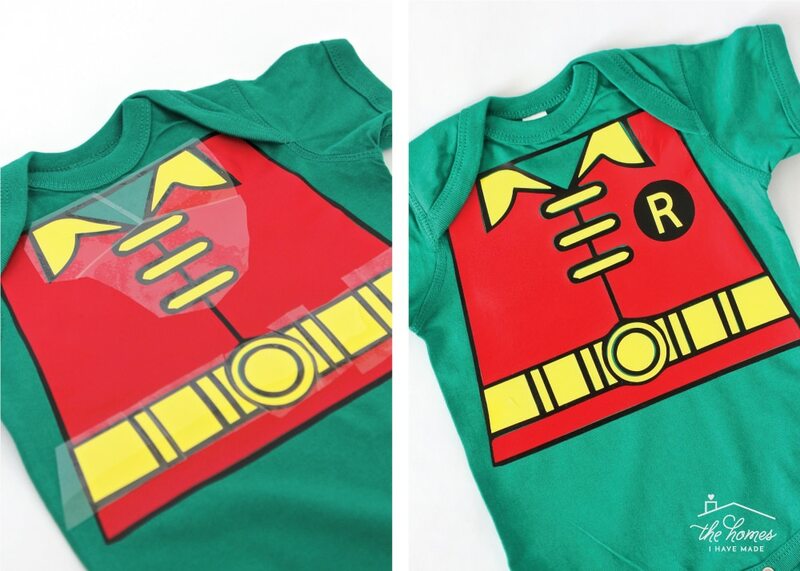 With that…the LEGO Robin costume is done…and adorable! 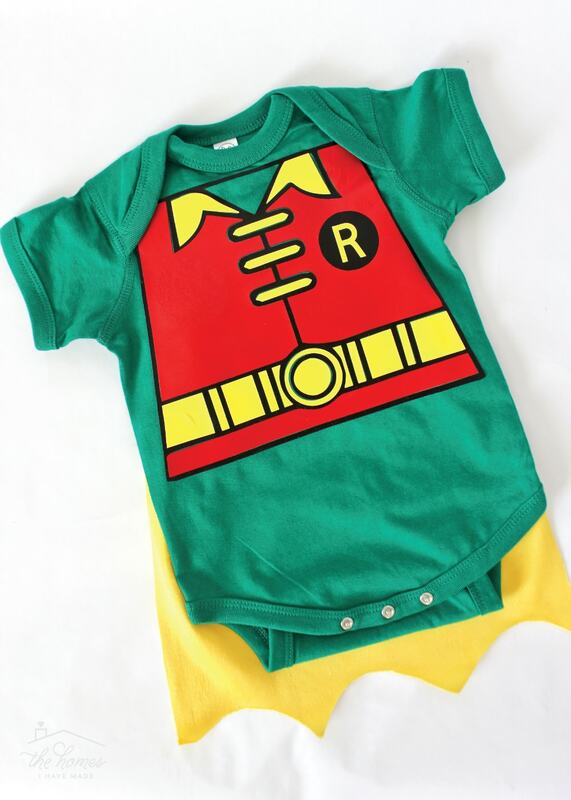 We paired the onesie and cape with a cute pair of green shoes and let Sam go pants-less (it was over 80 degrees after all!). 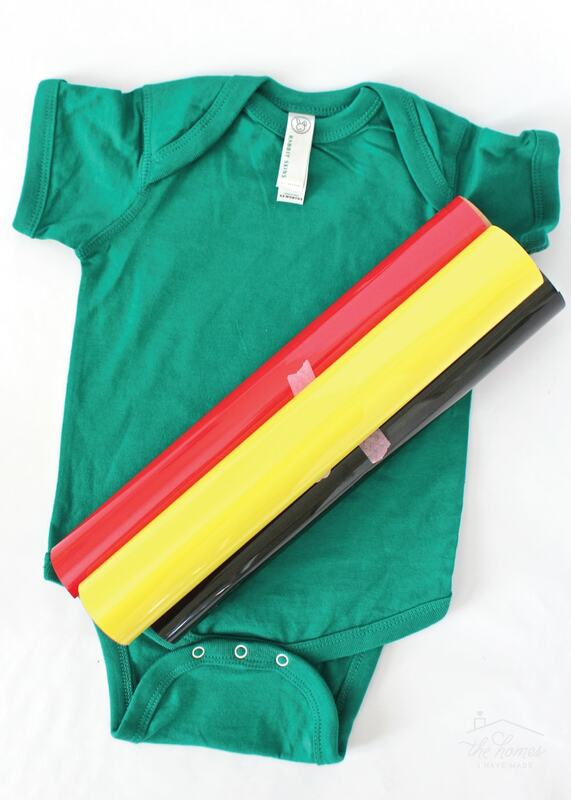 If your Halloween night will be cold, you could always try brown/tan leggings under the onesie; but don’t overlook the green shoes! They totally make it! Phew! Writing out all those steps was far more exhausting than making the costumes themselves. 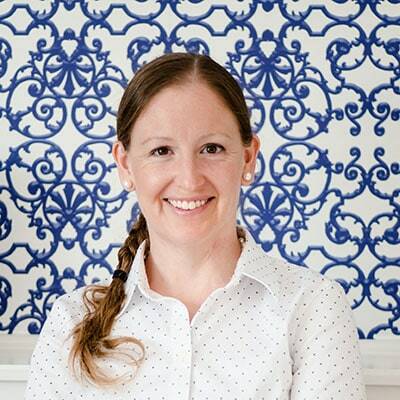 It may seem like a lot, but I promise…each and every element comes together relatively quickly. 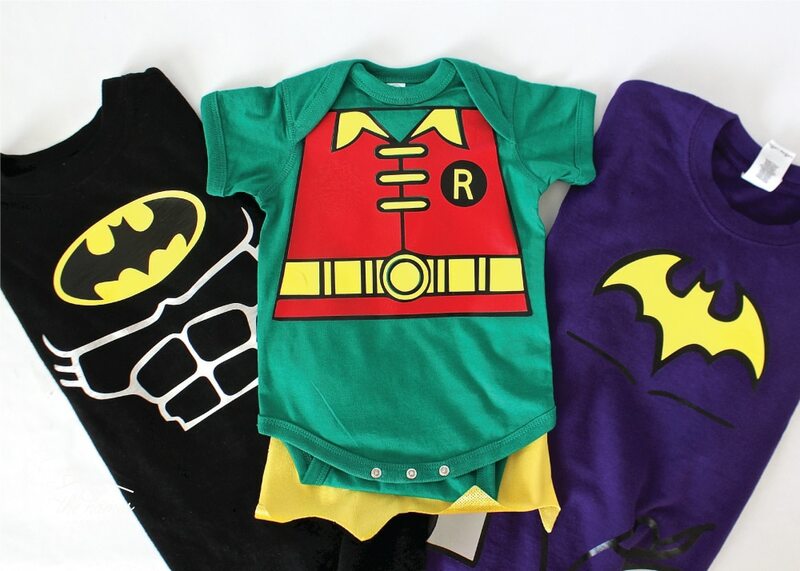 I suggest making all the shirts at once, all the capes at once, etc…and before you know it…you’re whole Batman clan will be ready to go! 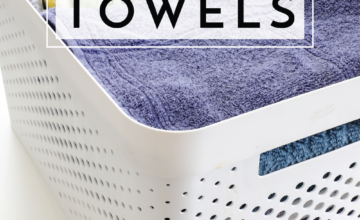 Again, most supplies can be found at your local fabric store, but here’s a quick roundup of some things you might need! And below are the tutorials that can help you complete these costumes! 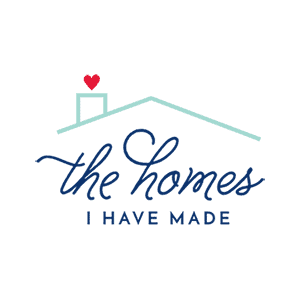 If you have any questions about what I have here…don’t hesitate to leave a note in the comments and I’ll be sure to clarify! This weekend, we are deciding what this year’s costumes will be and so far…Star Wars is the front runner. Any ideas out there on how to make a BB8 costume?!?!?! Happy weekend and see you back here next week! Hmmm, tricky. Maybe papier-mache a Pilates ball, cut into two halves, affix shoulder straps (like a sandwich board), and paint? That’s a lot of papier-mache though. Good luck!